A common application for GPR is that of cemetery investigations and mapping. Such investigations may include grave consolidation (searching for free plot allocations), headstone realignment, or general site characterisations. Subsurface investigation within cemetery environments is a very sensitive issue with both individuals and the community and in most cases the investigation requires a non destructive testing method which has minimal to no impact on the grounds and surrounds. The MALA MIRA 3D system is the ideal instrument to gather such subsurface information in a discreet, efficient manner. ​The MALA MIRA 400MHz antenna is custom mounted to the front of a John Deere mower. With a 400MHz antenna running 16 GPR channels, the system is setup to only require a single pass over the surface to gather enough data for 3D modelling. Data collected from the survey is then returned to MALA GPR Australias office where a qualified MALA geophysicist analyses, post-processes, interprets and reports on the data/project. The entire rig arrives on site on a trailer and is pre-setup to virtually begin data collection almost immediately. 3D GPR Mapping is also useful for applications such as archaeological and heritage investigations. Similarly to cemetery investigations, specific care needs to be taken with the survey approach to minimise community and individual concern and to instill confidence about the project. 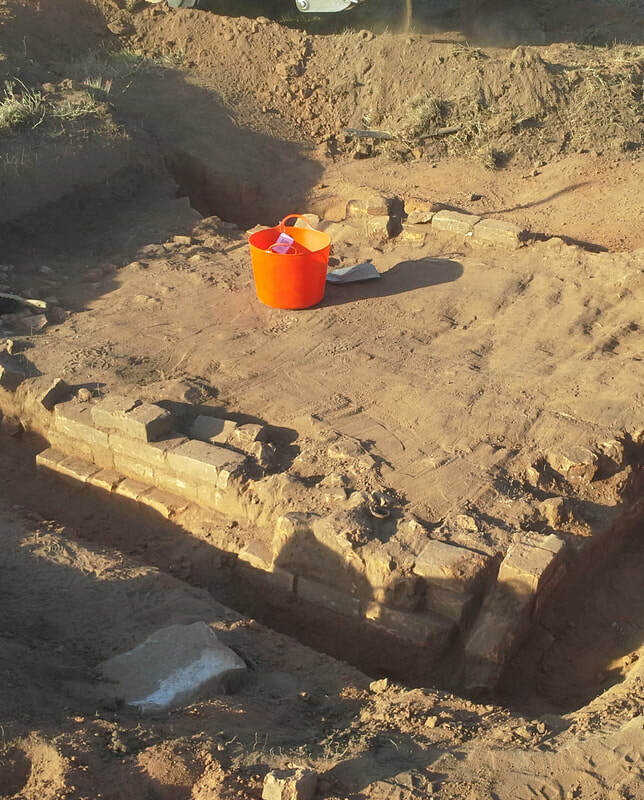 Archaeological and heritage targets need to be carefully examined to ensure their historical value is maintained and not disturbed. coinciding grave locations. Using the MALA 400MHz system and full RTK GPS support the area was mapped within a few hours. Experienced interpretation of the data within a dedicated post processing software package provided sufficient information to present results on the project. Figure 1 below shows interpretations (yellow) made to outline the extents of plots based on GPR data collected. Blue dots indicate GPS points taken at every headstone which in turn made it possible to determine the graves orientation compared to the headstones and centre slab. The data (yellow interpretations including depth, and blue GPS survey points were delivered in a .dxf format for CAD import. Depth slice of postprocessed GPR data with anomalies outlined in red. .dxf export with interpretations overlain onto google maps. Data successfully displays grave orientations. Application – A large cemetery in the middle of the Australian outback (Flinders Ranges) has had a history of extreme weather and in this case, severely affected by dust storms. Excessive dust and flooding had covered and moved headstones and grave markers making it very difficult if not impossible to re locate the graves and replace headstones. Again, the MALA 400MHz system with full RTK GPS was deployed to survey the cemetery area. The survey took an entire day and returned helpful results to locate individual plot locations in order to re label graves along with site plans and records. Similarly the data was delivered as a .dxf incorporating sub inch accuracy GPS coordinates which in turn allows for easy relocation of interpreted features. A zoomed section displaying anomalies (red outline) Anomalies are subtle yet the density contrast is visible. 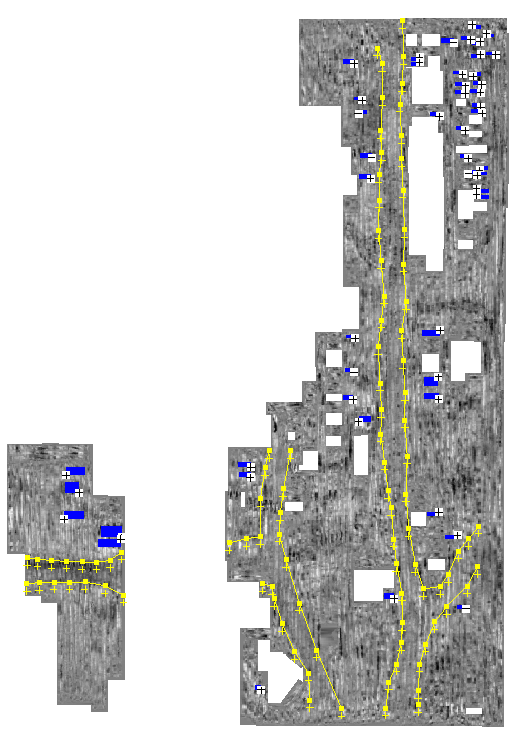 Interpreted grave locations (blue) along with the interpreted location of the road/pathway (yellow) through the cemetery.